Talk about drawing attention on your next camping trip! 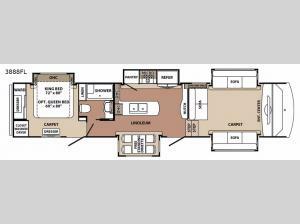 Now you can do so with the Blue Ridge 3888FL fifth wheel. This model features three sofas, a free standing dinette, L-shaped counter with double sink, and plenty of overhead cabinets. Double entry doors help give a smooth flow of traffic throughout the unit. You can choose to unwind at night in the entertainment center or jump into the comfortable king bed or even choose the optional queen bed with nightstands on either side. Why not keep the night alive by socializing underneath the 14' electric awning with LED lights?! 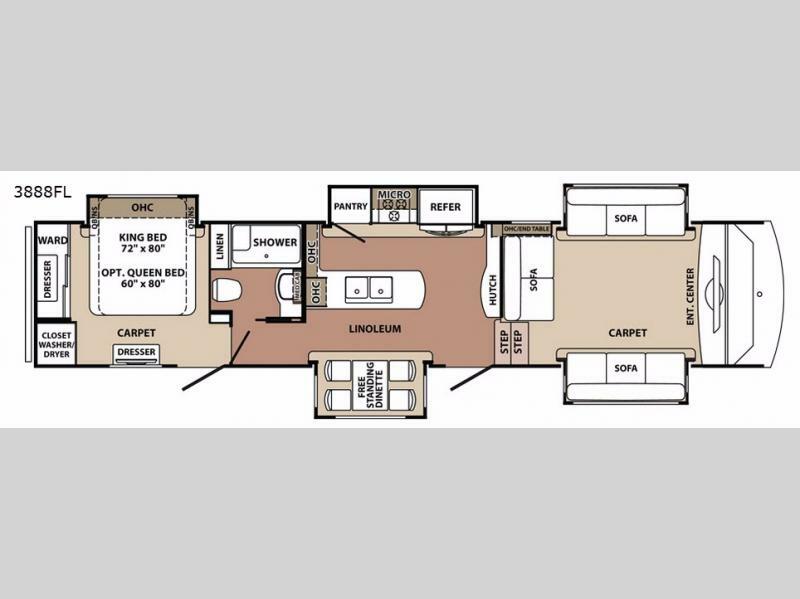 In any Forest River Blue Ridge you will experience a fifth wheel that offers luxury without breaking your budget. These models offer some fun features such as a key fob that operates the slide outs, awning, patio light, front jacks and rear jacks. A high gloss pigmented gel coats the exterior and the suspension system is constructed with a MOR/Ryde 3000. On the inside you will enjoy the residential appliances, crown molding throughout, and the solid hardwood maple raised panel cabinet doors and drawers.